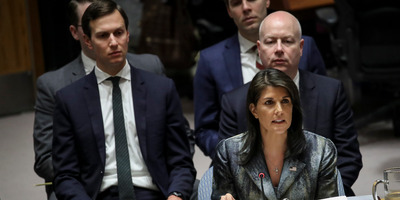 Drew Angerer/Getty ImagesWhite House Senior Advisor Jared Kushner looks on as U.S. ambassador to the United Nations Nikki Haley speaks during a United Nations Security Council meeting. Nikki Haley, the US ambassador to the United Nations, lavished praise on President Donald Trump’s family while announcing her departure from the administration. She pointed to his work on the reconfigured NAFTA deal and the ongoing development of a Middle East peace plan. “Jared is such a hidden genius that no one understands,” Haley said of the White House adviser. Trump confirmed to reporters he’d accepted Haley’s resignation and said she’s expected to leave the administration “at the end of the year” – a planned “break” from government service. He added he’ll announce a replacement for Haley within the next two to three weeks. 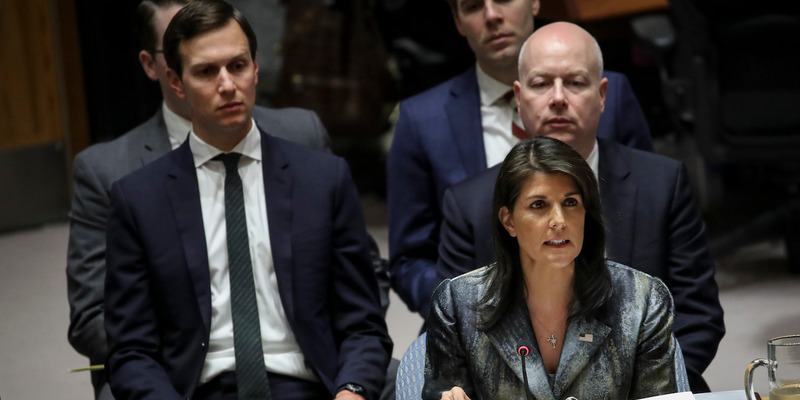 The president emphasised that he remains on good terms with the outgoing ambassador, and said Haley has done a “fantastic job” at the UN and that she’s “very special” to him. “She’s somebody that gets it,” Trump said. “I’ve given everything I’ve got these last eight years,” Haley said, referring to her six years as governor of South Carolina. She added that it has been “the honour of a lifetime” to serve in the Trump administration and said that the US is “respected” and “strong again” because of the president’s leadership on the world stage.